Taking over the field, the new Proto Reflex Rail is your stepping stone to greatness. High-end performance in a durable and reliable setup. The Proto Reflex Rail is for the serious competitor, featuring Fuse Bolt Technology, operating at 145 psi . 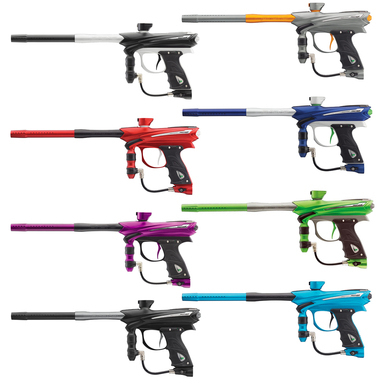 Color coded o-rings for simplified maintenance, and a host of other features make the 2014 Reflex Rail the gun of choice. The durable Reflex Rail solenoid features consistent airflow with a dwell of 18 milliseconds. The small, light Hyper3 In-Line air regulator provides high flow and smooth velocity adjustment, with non-slip grips. The ultimate in ergonomic comfort, The Ultralite Frame is equipped with an adjustable Reach trigger. The solid construction consists of an aluminum body, bolt, Ultralite Frame and trigger. The Reflex comes with a precision honed two piece 14 inch barrel, durable zippered gun case, parts kit, Dye Slick Lube, barrel sock, allen key set and 9-volt battery. The Reflex weighs in at 1.94 lbs. The UL 45 frame is the culmination of top pro player influence and progressive engineering. The hour-glass UL frame was ergonomically designed to give the player complete control of the marker. It also allows players to quickly and effortlessly pull the trigger. An integrated heads up display LED light alerts you to the status of your marker without taking your eyes off the game. The adjustable cam lock lever allows you to securely lock you Rotor onto your gun without tools. DYE’s cam lock feed neck sits low and tight on the marker making sure your Rotor stays low profile with the rest of your gear. The Reach Trigger is the next evolutionary step in individually customized ergonomic comfort as well as optimal trigger speed. With the Reach Trigger it is possible to adjust the angle and reach of your trigger externally. The new angle adjustment combined with the travel and spring tension allows you to create a personalized fit to reach your ultimate shooting capabilities. Color coded o-rings make it easy to quickly identify the correct replacement o-ring when performing maintenance.